Mara! meets Marais unites the talents of three members of the renowned World Music ensemble, Mara! 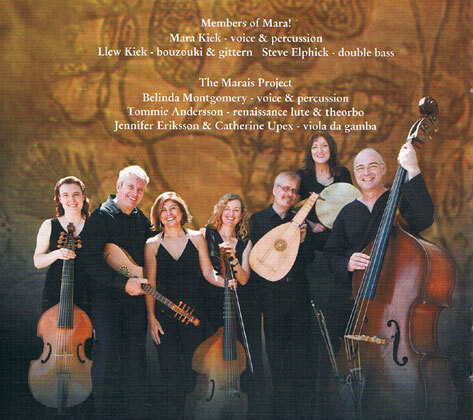 (Mara Kiek - voice, Steve Elphick, double bass and Llew Kiek – bouzouki & gittern) and Australia’s masters of the viola da gamba repertoire, The Marais Project, (Belinda Montgomery – voice, Tommie Andersson – renaissance lute & theorbo and Jennifer Eriksson & Catherine Upex – viola da gamba). The collaboration is built around Mara Kiek’s re-working of a hauntingly beautiful 13th century song cycle, Cantigas de Amigo, by Portuguese troubadour, Martin Codax. Music fans have associated Kiek with the Cantigas since her acclaimed 1987 UK recording of the songs with her award-winning ensemble Sinfonye.